Combustible dust hazards are a real threat for any processor that stores, handles or processes solids. 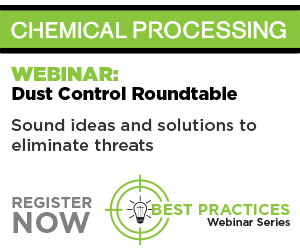 In this 7-minute video, Traci Purdum, ChemicalProcessing.com's senior digital editor talks in-depth with Guy Colonna P.E., Division Manager at the NFPA about implementable practices for mitigating the risk of dust explosions. Included in this video are best practices for hazard analysis, protective measure methods, process change management and developing a dust hazard protection program. Watch now. You can also view the rest of this series: Part Two. Part Three.